This week, we talk about all the good stuff we’re throwing into our picnic baskets (fried chicken, salads, pie etc. 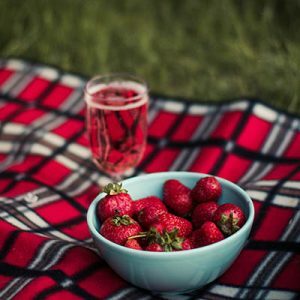 ), plus, ideas for chilled strawberry soup, frosty strawberry daiquiris, and a dreamy strawberries and whipped cream cake (use a boxed cake mix, if you like!). We also discuss the joy of sharing a really good bottle of wine with friends—even over burgers.